Folks always talk about how patience is a virtue, well I think impatience is every bit the virtue patience is and then some, because impatience gets supper, or in this case breakfast, on the table a whole heck of a lot faster. The holidays are upon us once again, and as usual, I’m struggling to keep up. While I love that the sons’ are so active, it’s been hard to keep up, and we’re just at the beginning. The hubs lost his job a month ago and, THANKFULLY, was back to work one week later, but for a staffing company. That means that, while after 480 hours, this job will probably become permanent, there’s no guarantee of 40 hours a week right now, or even a guarantee of what hours he’ll be working a week, or if it will even be locally. We had gotten comfy with the whole 9-5 thing. Now he’s stuck with calling a number each night and showing up on site at whatever time is told. Recently, that’s meant he’s had to get up at 4 am to drive for two hours to meet on the job. I just have to say that I’m so proud of him. Even if it’s meant he pulled a 12+ hour day, to turn around tomorrow and drive an hour to work on fumes of sleep to do it all again. When it comes to our family, he gets it done! I know I’ve said it before, but I really don’t do breakfast. I am SO not a morning person. The sons know, don’t wake Mom up unless there’s a problem. The hubs learned that lesson the hard way. BUT, that doesn’t meant I always want them to be stuck in the land of cold cereal or a mushy bowl of unappetizing instant oatmeal. I don’t want to do that to the sons all the time, and I definitely don’t want to do that to him. And that’s why we have these little breakfast stars. Just think of them as the healthy version of McDonalds McMuffins, except they taste 10000x better. Perfectly portioned breakfast sandwiches, ready for a quick re-heat. Aaaannnnd … let’s DO this! 1. Preheat oven to 375 degrees. Lightly oil a cupcake pan, or coat it with nonstick spray. 2. Add one egg to 6 different ‘cups’, beating slightly. Season the eggs with salt and pepper. Place the pan into the oven and bake until the eggs are cooked through, about 12-14 minutes. 3. 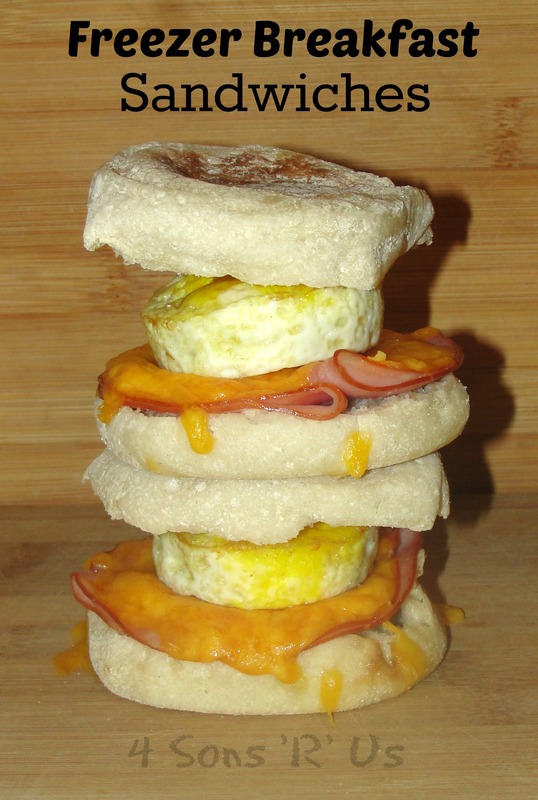 Place 2 slices ham and 1 slice cheese on the muffin bottom, top with one baked egg, and then cover with another muffin top to create a sandwich. Repeat with remaining English muffins to make 6 sandwiches. Wrap tightly in plastic wrap and place in the freezer. 4. To reheat, remove plastic wrap from the frozen sandwich and wrap in a paper towel. Place into microwave for 1-2 minutes, or until heated through completely. Elaine, he really, truly is. I thank God everyday that he brought him into my life. I’m forever going to be grateful for agreeing to my first blind date!! This is everything I need! I’m very much like you, I’m not a morning person at all and I rarely eat breakfast (mostly because I’ll get up at the last possible minute so there’s no time for breakfast! ), but if I had something like this that I could just quickly reheat I think I’d be more on board for breakfast! Bless your hubby too, you definitely got a good one there! The same thing happens here, and then by 10:30 my stomach is screaming, well not screaming, but that would sound more pleasant than the funky grumbles and growls that everyone in a mile wide radius can hear. So, two birds, one stone … err, sandwich! Your Freezer Breakfast Sandwiches are wonderful and a recipe that I will be trying. Thank you so much for sharing with Full Plate Thursday and have a great day.